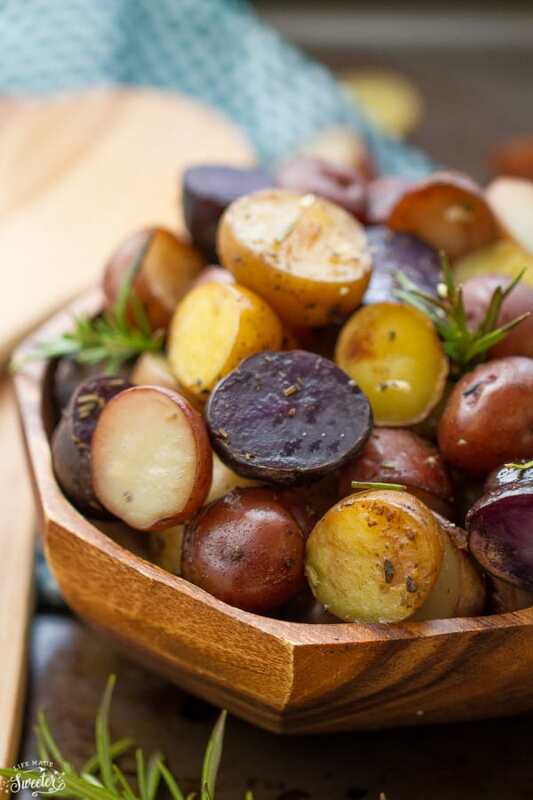 Slow Cooker Garlic Rosemary Tri-color Potatoes are the perfect easy side dish. Best of all, they can be baked or grilled and are loaded with rosemary, thyme, oregano, garlic and a sprinkle of Parmesan. Side dishes are my absolute favorite at any gathering. I would happily load up my plate with tons of roasted vegetables, pasta salads and cheesy potatoes. 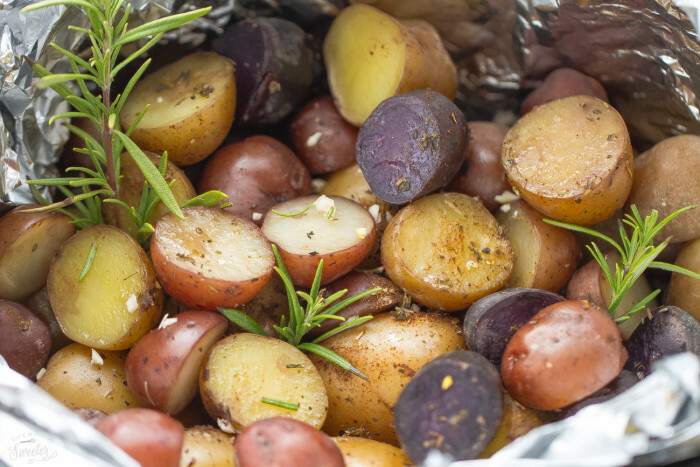 These Garlic Rosemary Tri-color Potatoes are a family favorite and they couldn’t be more simple to make. 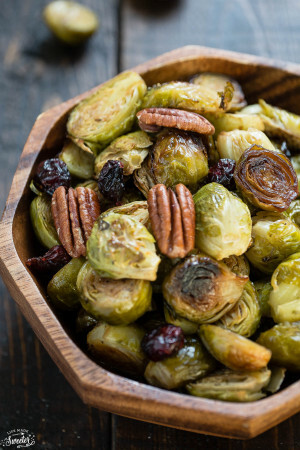 You can make them in the slow cooker or toss them on the grill when you don’t want to heat up your house.And when it’s cold outside, you can easily roast them in the oven. Grab a bag of the multi-colored potatoes (or the Baby Dutch potatoes). Cut them in half or quarters – as long as they are all roughly about the same size. Drizzle with a little bit olive oil, fresh garlic and some herbs. Cook the potatoes until they are perfectly crisp-tender. To make sure they cook evenly, you’ll want to toss the potatoes around a few times while they’re cooking. It’s an easy side dish that takes hardly any effort. Perfect for summer with some grilled chicken or Thanksgiving with some roasted turkey. Tender and crisp tri-color potatoes loaded with rosemary, thyme, oregano, garlic and a sprinkle of parmesan. An easy and simple side dish made in the slow cooker. Cut potatoes in halves or quarters but making each of them approximately the same size. 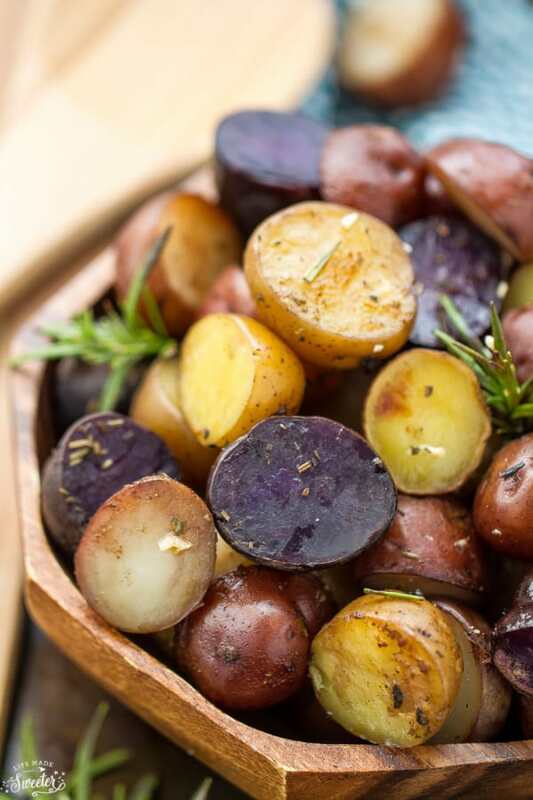 In a large bowl, combine potatoes with olive oil, garlic, oregano, thyme, and rosemary. Season with salt and pepper, to taste and toss to coat evenly. 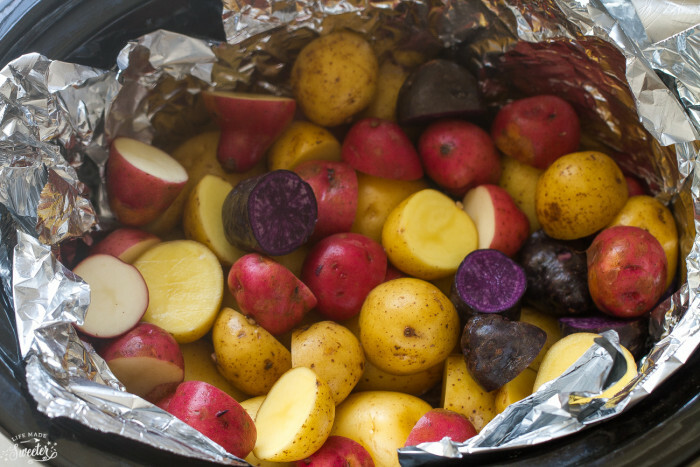 Line a slow cooker with aluminum foil, leaving a slight overhang to wrap the potatoes on top. Coat a thin layer with nonstick spray. Add potatoes into the slow cooker and cover and cook on low heat for 4-5 hours or high heat for 2-3 hours, or until tender. Sprinkle with Parmesan if desired. Serve immediately. Divide the potatoes into two 24-inch square pieces of heavy duty aluminum foil. Seal foil over potatoes. Grill over medium heat for 30 minutes or until tender, turning once. Preheat oven to 400 degrees F. Spray a large rimmed baking sheet lightly with cooking spray. Place potatoes in a single layer on baking sheet. Bake for 25-30 minutes, or until golden brown and tender. Sprinkle with additional Parmesan cheese, if desired. I’m definitely the person that’s eagerly awaiting all of the delicious side dishes! And potatoes are one of my favorites. These look fantastic, Kelly! I’ve never thought of making these in the slow cooker before, what a great idea! And I love the seasoning on here too, just perfect! And these potatoes look banging girl…love that rosemary addition! pinned! I love the side dishes too. My family always does a smoked turkey (no oven required! ), but I always find myself going after the sides first. These potatoes look so good! Rosemary is my favorite herb to add to potatoes. These potatoes look incredible, Kelly! I love different colors. And anything that calls for use of the slow cooker is a win in my book. Such a colourful and beautiful side dish. Potatoes and rosemary are the best friends, ain’t they? This is such a gorgeous side dish Kelly! I’ve never had much luck with potatoes in the slow cooker but I definitely need to try again, because these look perfect! Love these tricolour potatoes Kelly! I’ve always wanted to try purple potatoes. They look so pretty! The garlic and herbs all sound so delicious. Such a great way to cook potatoes! Potatoes have become a staple in our home recently – we’ve grilled them, baked them, pan sauteed them and curried them – but Kelly, I’ve never cooked them in a slow cooker – such a great idea! 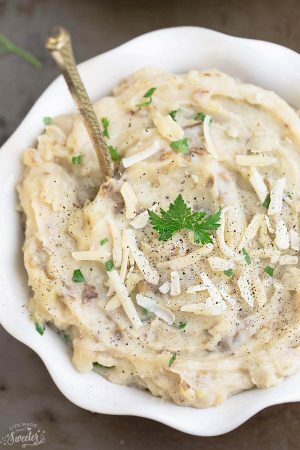 Love your use of tri-clored potatoes for this delicious and comforting dish! 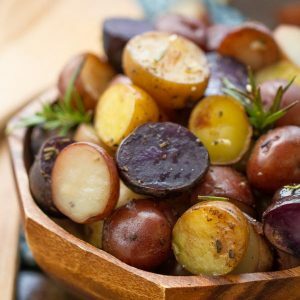 Garlicky, herbed potatoes are my weakness and these look just divine! I love tricolor potatoes – tricolor carrots and cauliflower too! Great idea making it in the slow cooker 🙂 Pinned! Mmm..you’re right–the sides are the best part of holiday dinners!! And these potatoes look like they’d be the first to disappear! Absolutely delicious!! Hi Kelly, I all about the sides, potatoes are one of my favorite foods, love how you treated them. Oh! Such a beautiful looking vibrant and delicious side dish, Kelly. Indeed, side dishes are the BEST part of holiday dinners. Purple potatoes are the way to my heart! I love them. . so pretty! love that you made this in the slow cooker!!! I’ve never done potatoes like this in the slow cooker before! Pinned! I’m all about the sides – especially the stuffing! I love that you made these festive potatoes in a slow cooker! They are so colorful and totally festive! Definitely have to remember this for Thanksgiving! A beautiful side dish! I’m with you. . .I often forget about the star of the Thanksgiving show as I am so consumed by all the fabulous sides that accompany it. I totally load my plate with the holiday sides too! Normally I’m turkey’d out by the time the actual day of Thanksgiving rolls around! Potato side dishes are always my favorite and I happen to love me some colorful baby potatoes! These are so perfect, Kelly! Cooking them in the slow cooker is a stroke of genius! Pinned! Cheers, my dear! Love that these are made in the slow cooker! They look gorgeous! potatoes are everyone’s favorite! love the herbs in here Kelly! So smart to make the potatoes in the slow cooker! One less thing to take up space in the oven! Tri-color baby potatoes are my favorite — the colors, the textures, everything! I love how easy this is with barely any clean-up! These look delicious, Kelly! These potatoes are gorgeous Kelly and I love that you cooked them in a crock pot! Ooh these look amazing! I’ve never tried potatoes in the slow-cooker before! Will definitely need to attempt! Kelly these look so delicious and I am loving all these colors!! Yummy! These look SOOO good Kelly! I’m seriously in love. Because I’m totally that gal who could care less about the turkey and is loading up her plate with sides. 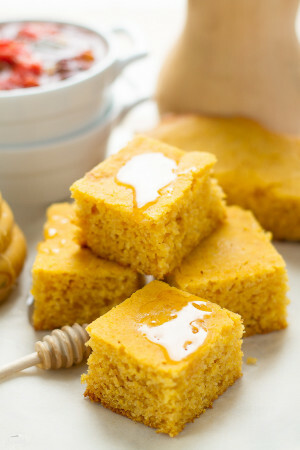 I can’t wait to try this recipe – pinned! Well, isn’t that a wonderful way to prepare potatoes!! My slow cooker needs a good excuse to make an appearance and now we have one! Thanks for sharing! Well those are the most beautiful potatoes I’ve ever seen!! Love that you make them in the slow cooker! My thanksgiving plate is usually full of potatoes, stuffing, and dessert. No room for the turkey at all. Haha. These would be a wonderful side! And all of the different colors are beautiful! These potatoes look fantastic Kelly! Love that these are made in the slow cooker!! Oh man these potatoes are calling my name! And they are so pretty! I want a big bowl of these for dinner! Love that they’re made in the slow cooker. So easy! Such a beautiful dish! I love potatoes on their own (and with a mound of hummus!) for dinner on a winters evening but have never come across tri-coloured potatoes before – how beautiful! I don’t eat turkey, so Thanksgiving for me is ALLLL about the sides. I could see myself loading my plate extra high with these! I just bought a slow cooker and I am loving experimenting with it now! I never knew you could cook potatoes in it! Love the look of this! 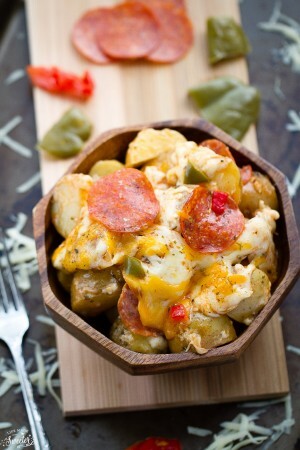 What a brilliant way to cook potatoes I have never thought of doing them in my slow cooker. I am definitely going to give these a go! These potatoes are beautiful! And I love the wood bowl you have them in! I want one! You make me want to use my slow cooker more!! I love that you line your slow cooker before cooking…great tip! And these potatoes look amazing! We love potatoes. These are so beautiful and slow cooking them, I’ve never done. Would be so flavorsome, I can imagine. Would be so good as a side. Perfect.